This paper describes the approach by using a magnetic field as a technique in order to synthesize well-aligned materials. The magnetic field technique could be a potential method because it has advantage that all of the materials could be aligned by magnetic field as long as they have magnetic anisotropy. The aim of this research is to explore the effects of magnetic field and magnetic line in the synthesis of well-aligned material, namely titania (TiO2). The synthesis of well-aligned titania with liquid crystal as the structure-aligning agent is demonstrated under magnetic field in the presence of liquid crystal, 4′-pentyl-4-biphenylcarbonitrile (5CB), tetra-n-butyl orthotitanate (TBOT), 2-propanol and water. The mixture underwent slow hydrolysis and drying process under magnetic field (0.3 T) in ambient condition. 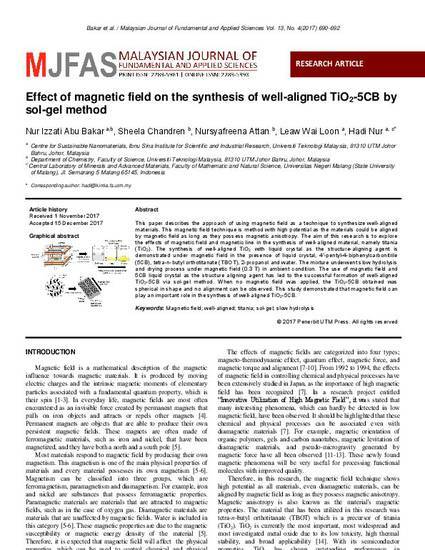 The use of magnetic field and 5CB liquid crystal as the structure aligning agent has led to the successful formation of well-aligned TiO2-5CB via sol-gel method. When no magnetic field was applied, the TiO2-5CB obtained was spherical in shape and no alignment can be observed. This study demonstrated that magnetic field can play an important role in the synthesis of well-aligned TiO2-5CB.